Thursday rant time: It’s time to get over loops, stop generalizing about music technology, and find the record button. A computer had generated it. I had helped things along but was more of a spectator. Nevertheless, “Eventide” was something I had created, and like all creations was entitled to a measure of emotional exuberance from its creator. Sure, the Times author set his expectations low, and is surprised when his track came out sounding decent. That’s the reaction of many people to GarageBand. But the assumption that the computer is somehow doing the work is awfully naive. The computer didn’t create anything. The results are nothing more magical than piecing together recordings of someone else’s playing, made easier by the software interface, but still the basic recorded music production process at heart. In fact, the fundamental nature of the process is producing a track, but without any interaction with the musicians — hence the relatively stale results. Look closely at some of the Apple Loops included with Apple’s software, and you’ll often see the names of the Apple developers who recorded the loops. (Others are licensed from a third-party developer.) They’re the ones who really created the track, with Mr. Walker as producer. Despite that, the author takes this as an opportunity both to imagine a future of music freed of actual musical talent, all the while criticizing his own work as being overly dependent on the computer. Huh? Mightn’t the clear message instead be that you get out what you put in, and that faking musical ability with loops might sound slick, but it won’t sound real? Failing to notice this wouldn’t be so bothersome, if KCRW’s Nic Harcourt and Walker alike didn’t try to establish a broader message about music. Does this really democratize music creation? In terms of establishing the musician at the center of the recording process instead of the studio, perhaps. But that’s nothing new. The tape recorder did that; accordingly, listen to a reissued Beatles demo tape, and it still sounds great. In fact, GarageBand changes nothing about the nature of recording, about musicianship, or about craft. But for some reasons music technology topics are license for mainstream newspapers to publish pieces with zero news, zero research, and strikingly little to actually say. Sounds like a blog entry to me. Sadder to me, though, is that the technology itself gets the blame, rather than the musician. It’s not just the Times story that’s frustrating here, because we’ve heard this far too many times before. Who’s to say GarageBand has to be mechanical? Plug in a guitar, a vocal, a MIDI keyboard, and play live. Turn off the metronome, if you want. 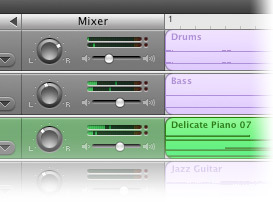 (How many journalists have missed the fact that GarageBand can record MIDI and audio?) The results might not sound good, but they will sound human. And that’s where the next hit will come from, if that’s really what you want. In fact, musical hits can come from novice musicians. Musical traditions around the world from folk to rock depend on untrained musicians, putting their heart and soul into a track. No technology is every likely to change that. But nothing’s stopping you from doing that with tools like GarageBand, either. Unless you can’t find the record button, that is. I hope that laypeople will come to better understand the technology, and that means we need to do a better job explaining how it works to non-experts. But even more so, I hope journalists will start to pay more attention to musicians, and try a little harder to actually learn something. And that’s by no means an elitist position. On the contrary, the writing I’ve most enjoyed doing has been when I’ve gotten to talk to master musicians in a variety of genres and listen to what matters to them. I know what my own process is, and I know what my own music means, so I’m not nearly as interested in that as I am in other people. It’s a tremendous opportunity to learn and grow, and it’s one of the reasons I enjoy writing — because it’s a chance to find out someone else’s story. So get over the loops already, and make some actual music. Even if it means singing badly over your new backing track. Most of the world’s music is probably still made in the shower, anyway — and I bet some of it isn’t half bad.